Top : Designers : Mark Ellis Design Ltd. The common thread of classic good looks, pleasing lines, practical features and excellent performance ties together all of Mark Ellis’s designs. Whether sail or power, custom or production, pleasure or utility, their versatility and performance for a multiple range of tasks is evident. Although produced by several different builders, each of the Mark Ellis designed boats are marked by a sense of pleasing proportion, knowledgeable use of materials and a meticulous attention to aesthetics and function not seen in today’s mass-market products. Web Site Snapshot: If available, above is a snapshot of the Mark Ellis Design Ltd. web site at http://www.markellisdesign.ca as it appeared when this site was added to the directory or last verified. 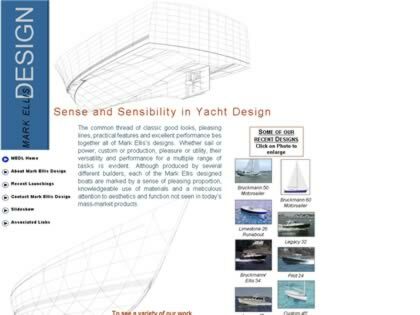 Please Note that Boat Design Net has no involvement with the above web site; all content and images depicted in the above thumbnail are the property and copyright of Mark Ellis Design Ltd. unless otherwise noted on that site. Description: The common thread of classic good looks, pleasing lines, practical features and excellent performance ties together all of Mark Ellis’s designs. Whether sail or power, custom or production, pleasure or utility, their versatility and performance for a multiple range of tasks is evident. Although produced by several different builders, each of the Mark Ellis designed boats are marked by a sense of pleasing proportion, knowledgeable use of materials and a meticulous attention to aesthetics and function not seen in today’s mass-market products.